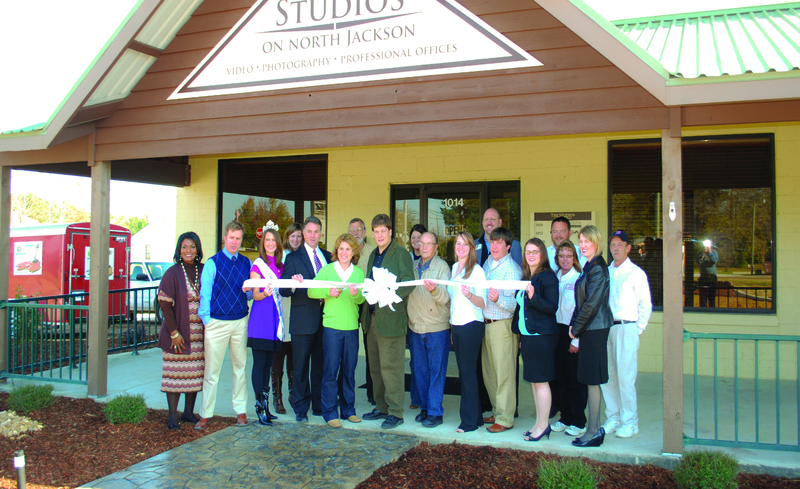 The Greater Starkville Development Partnership sponsored a Ribbon Cutting Ceremony for Broadcast Media Group at the new Studios on North Jackson. Broadcast Media Group has been in business for 13 years, but held an Open House Nov. 19 to celebrate the relocation into the Studios, which Broadcast Media owner Robbie Coblentz and his wife Bonnie Coblentz renovated with a vision in mind of creating incubator space for small businesses, as well as other professional offices. Attending the Ribbon Cutting were GSDP Events Coordinator Tasha Hill, Architect Chris Cosper, who also has his offices at the Studios and designed the property’s new floor plan, Miss Hospitality Haley Smith, GSDP Administrative Assistant Robyn Cain, GSDP President and CEO Jon Maynard, Charlie Griffin, Jobman USA, Bonnie Coblentz, Broadcast Media Group President Robbie Coblentz, GSDP Ambassador Mandee Lewis, Bob Coblentz, Trisha Coker, BMG, GSDP Ambassador Phil Hartness, Richie Davenport, BMG, Laura Crum, BMG, Richard Linley and Cindy Seymore of Northeast Exterminating, GSDP Vice President of Membership and Community Development Allison Matthews and Jimmy Wilbourn.